The seat for those who aim to build a large world for themselves and their beloved ones by taking advantage of the narrow spaces at max. It is a sectional that fits into modern sustainable lifestyle, reflects simplicity and is based on basic needs at home. If a place for just a few people at your non-crowded and plainly decorated home is what you look for, then you might have just found the seat you need. 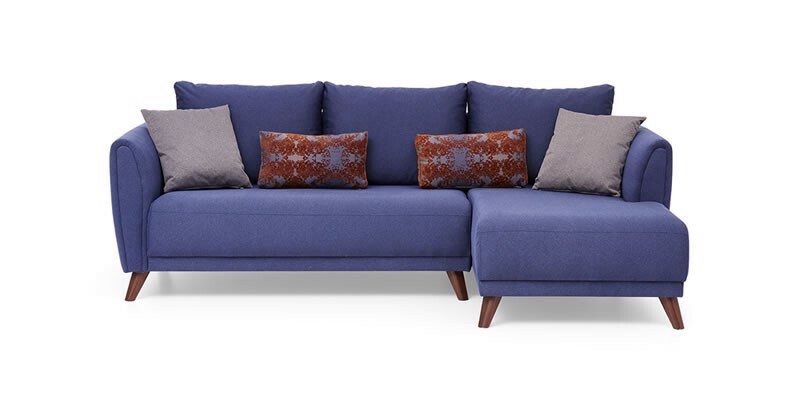 Because Andy Sectional is based on the philosophy of "neither too little, nor too much, just about the right amount" that has penetrated every aspect of the lives of Swedes. According to this notion known as "lagom", Swedes argue that the way to create perfect balance in living spaces is through simple and aesthetic decoration solutions. An bare clean layout and simplified choices fully meet the design of Andy Sectional and the comfort it provides. Andy's minimal lines unites with the decorative stitches on the arm sides, rich cushion implementation and the long wooden legs. Modern elegance comes to life with harmony and balance. Designs shaped with natural materials creates bright and spacious spaces. The monochrome palette completes this timeless style. The new modernism conception of fashion and decoration goes parallel with minimalism. Regardless of all the fashions and micro trends, the rules are simple for those sticking to simplicity: Consider Andy Sectional as the key set for the room. Let the minimalist tones compatible with its colors lead the way to the supporting actors such as wall, parquet and carpet colors. And let the wooden stand and other accessories define the movement frequency. The Result: A simple, sincere and comfCOFFEEble living room. ANDY Quality hidden in details.